The best way to understand the game is to play the game. Or watch them play the game! Make it a special date by grabbing a bat at SMAAASH and letting them face-off with professional cricketers on a virtual screen. With Brett Lee bowling, watch the happy glee on their face as they angle the bat for the perfect score – and have a riot of fun and excitement together! After all, cricket fever catches on quick! Take a trip with bae to one of the most scenic cricket grounds in India, Chail, Dharmshala to watch a match at the height of 7,000 feet over sea level and be surrounded by the picturesque beauty of the hills. An overnight trip from Delhi, this one is perfect for those who want to combine their passion with a getaway. Bond over delicious food, cheering for the team and create some serious #relationshipgoals moments. They say wear your heart on your sleeve – so add in amazing cricket merchandise to their cricket. From T-shirts that can be personalised with the name of cricketers and other apparel, gear, footwear, fan merchandise – get anything that scream cricket with just a click of a button. You can get even get funky briefs to quirky workout bags, this is one style statement you would want to make all the time. And if watching a match alongside doesn’t excite you as much, we’re sure you can grab a copy of Man Of Her Match. 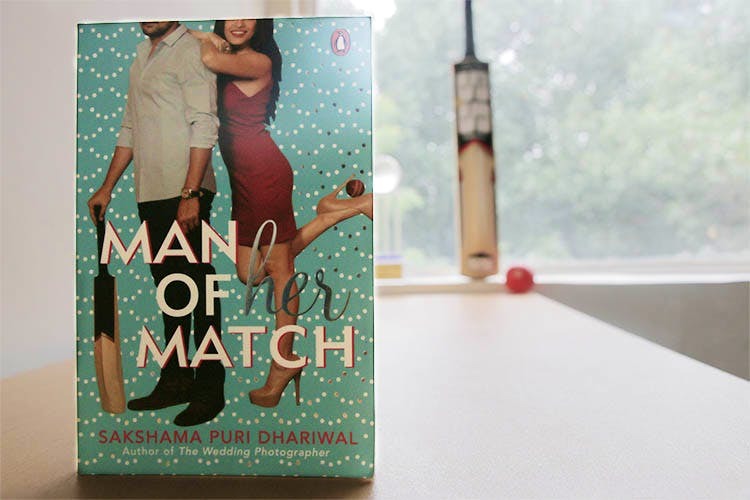 A page-turner by Sakshama Puri Dhariwal, deep delve into the world of cricket and romance with sassy exchanges, witty dialogues and intelligent characters. A breezy read, this is one feel-good, light-hearted romantic novel you’ll be recommending to all your friends too.